In 1993 he graduated from Université Paris V – René Descartes, “oral surgery” specialization. Between 200 and 2004 he was university assistant at “Université Paris V – René Descartes, Hopital Albert-Chenevier“ – Faculty of Surgery. Starting with 2004 he is consultant at: CHU Henri Mondor – Albert Chenevier, Assistance Publique – Hôpitaux de Paris”. Since 2005 he is a member of Societe Francaise de Parodontologie et d’Implantologie Orale”-Paris. From 2009 he is part of the “Association Francophone de Formation Continue des Chirurgiens Dentistes – AF²C²” medical team. 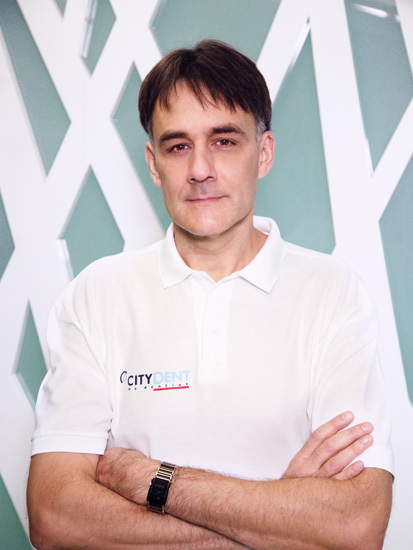 Being specialised in periodontology and implantology, he deals within the clinic with patients suffering from periodontitis and those in need of Biomet dental implants. Dr. Vaideanu is also skilled in making gum and bone grafts.